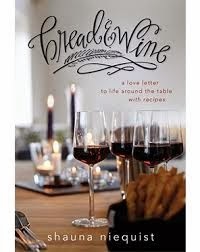 Several friends told me about this recently published book, Bread and Wine, by Shauna Niequist, thinking I would enjoy it. It is filled with stories of community, food, faith and life around the table – as well as corresponding recipes. Also, the book is endorsed by Anne Lamott and Brene Brown, two of my favorite authors, so I knew I would enjoy it. I bought the book and had the chance to read it over the holidays. It is inspiring! It made me want to have a cooking club, try every recipe, and keep a record of the special occasion menus we have like Shauna does. I have tried several of the recipes and so far have loved them all. 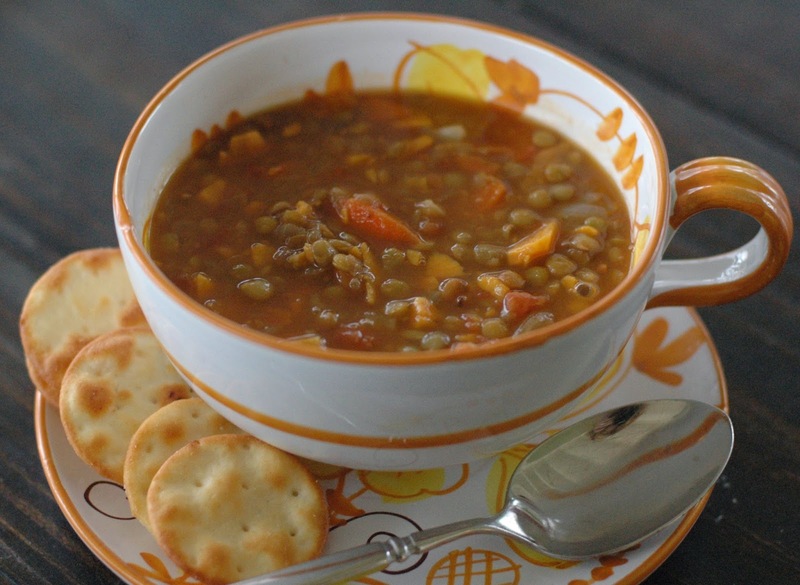 Super-Healthy Lentil Soup, because January seems to call for soup! 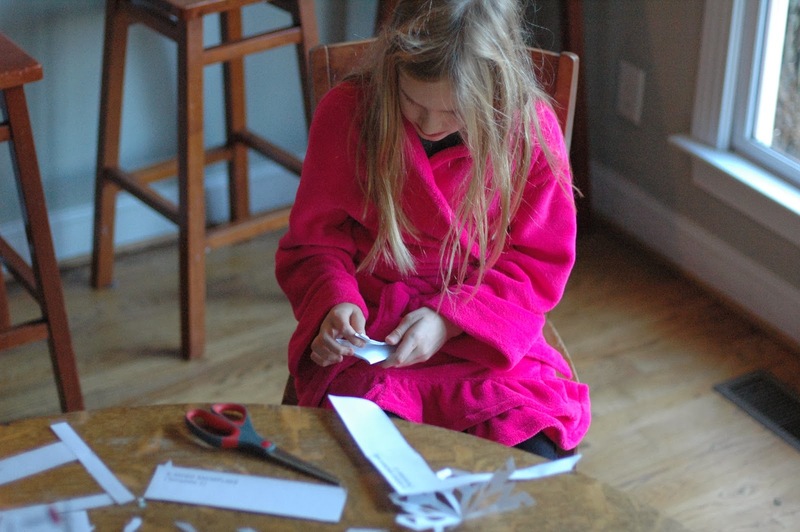 This is my adapted version of her recipe. It’s really simple to put together, makes a big pot, and keeps well. Shauna introduced this recipe in the book as the one she makes when she’s had too much feasting and needs something healthy, nutritious, to have on hand. I made it a week ago and shared it with two friends, who immediately asked for the recipe and later texted me that they kept thinking about the soup. I laughed. Lentil Soup was not the food that I thought would make such an impression. However, it really is that satisfying. It’s not fancy and the texture of lentils takes a little getting used to. But it is warm, savory, and hits the spot on a cold day. And Lentils are a great source of protein, fiber, iron and are low in fat. I added sweet potatoes to the recipe – because I love them in soup, they are a pretty amazing source of all-things-nutritious, and I had them in my pantry. I made it again Thursday night so I could eat on it this weekend and share it with some more people in need of a container of soup. Add broth, lentils, and tomatoes with juice, and bring to boil. Season with salt, pepper, rosemary and a splash of vinegar. And this Caesar Salad was one that I couldn’t wait to try after reading her description in the book. It goes nicely with the soup too! 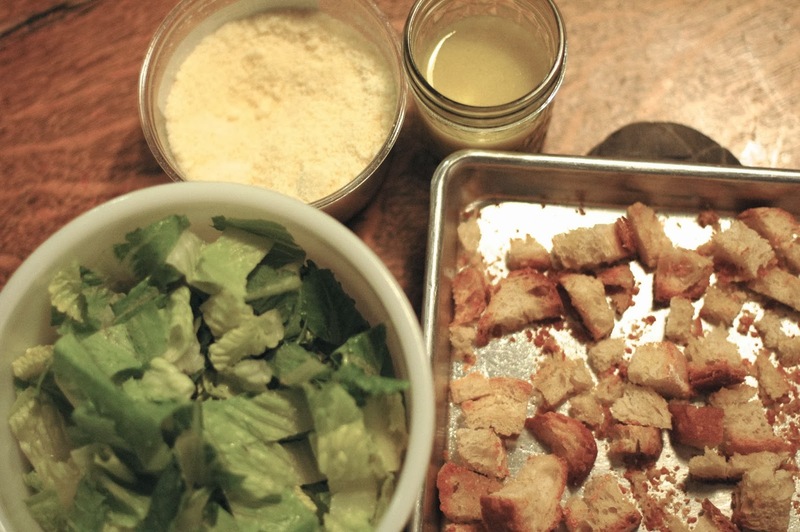 It’s basically comprised of: homemade croutons (which are like the ones I made HERE but with parmesan added to them before baking); chopped romaine lettuce, parmesan cheese and this yummy zesty dressing. Chop garlic clove in food processor, then add remaining ingredients and blend together. Or chop a garlic clove, drop it into the bottom of an old jelly jar, add everything else, and shake like crazy. 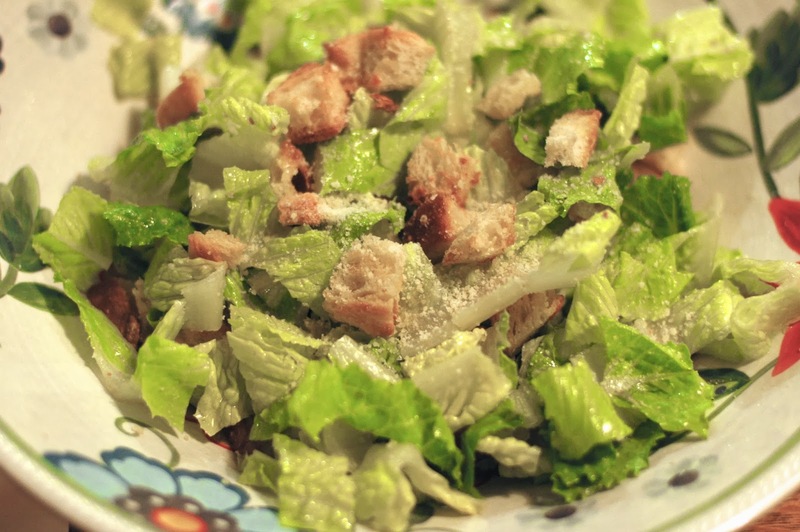 Toss lettuce with croutons, parmesan, and dressing. 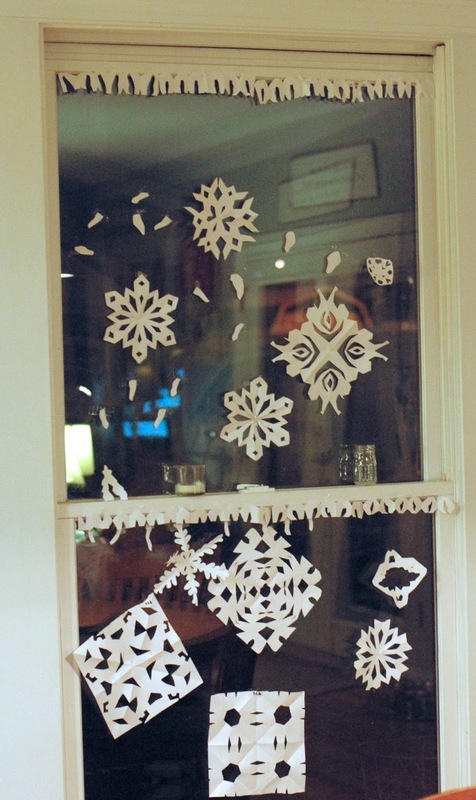 Also this month, we carried on our annual January tradition of making paper snowflakes to hang in our windows. Everything is so grey and drab in our city, it seems to add some whimsy. 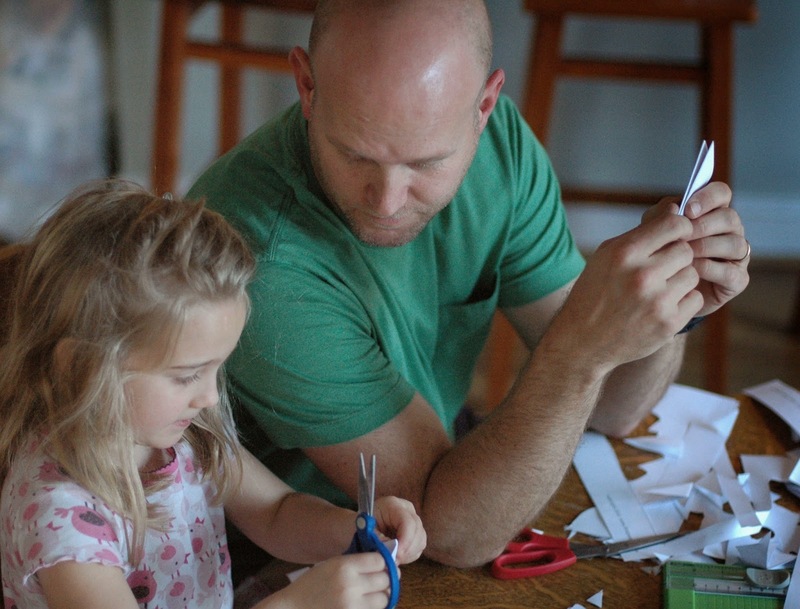 We usually look online for some patterns, like THESE, and then get inspired to make our own patterns. I hope your January is going well – that tasty, healthy soup and zippy, crunchy salad are finding their way to your table and shared with friends. 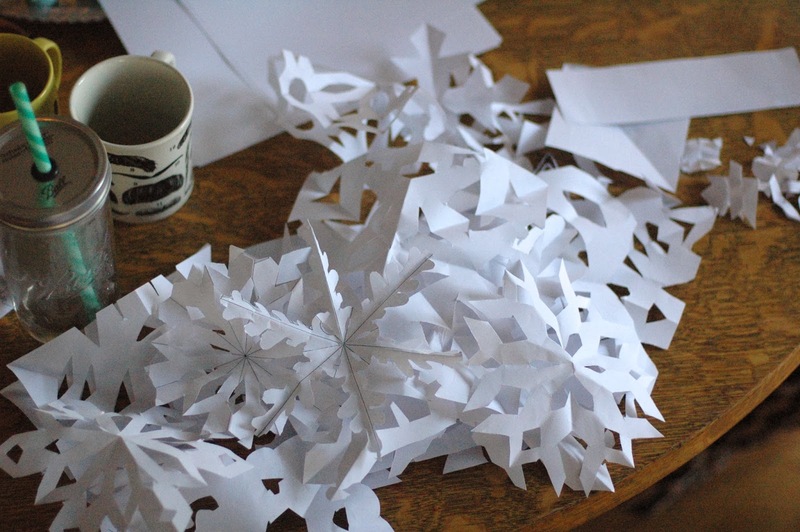 And that the only snowflakes inside your home are made of paper! Loved Bread & Wine! I was actually a recipe tester for it- I made the Sullivan Street Bread. Have you made Annette's Enchiladas yet? AMAZING. Yay! last week was our week of Julie's soups! tortellini, black bean, and baked potato. Looks like I need to add this one to next week's calendar. 🙂 thanks for blogging it! What a great opportunity! I HAVE made the Enchiladas…YUM! I haven't tried the bread. Any tips? 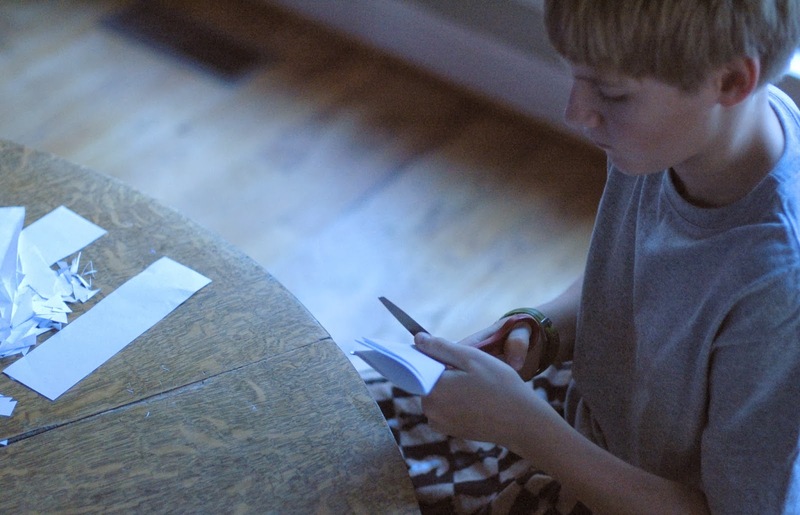 I need to watch the video book club now that I have read the book. And yes, my kids are growing at lightning speed!! Hope you are well. That's hilarious… and encouraging. 🙂 Thank you! Was totally inspired by this book, led a fall supper club small group around it, and everybody loved it so much we are continuing it this spring. A couple of the recipes have become standards in our homes. There's just something blessed about the miss of low fuss food and story.